Transcribed from manuscript. Anne C. Lewis Scrapbook. Memories of The Homes of Grandma Lewis written for her Grandchildren. Philadelphia: 1896. 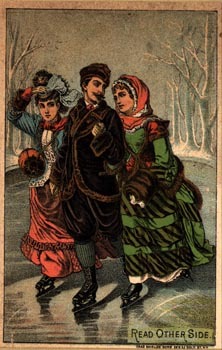 "The story of our life in the Eighteenth street home would be very incomplete were I to omit talking of the pleasant memories connected with Eastwick Skating Park. Your Grandfather had from his boyhood been fond of skating and I had often wondered what pleasure he could possibly find in a sport enjoyed under such conditions of cold and exposure. 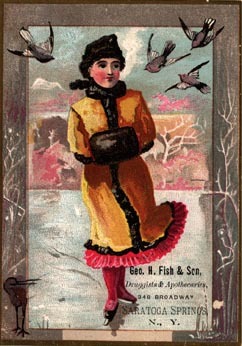 But in the winter of 1863 there arose a new fad in society, and a few ladies ventured upon the ice. Club house of the Philadelphia Skating Club and Humane Society on the Schuylkill River near Turtle Rock, Fairmount Park. Illustrating light ladder and reel mode of rescue. From: Anne C. Lewis Scrapbook. Philadelphia: 1896. Click on Image for larger view. There the meadow on the west bank of the Schuylkill at Walnut St. was fenced in. 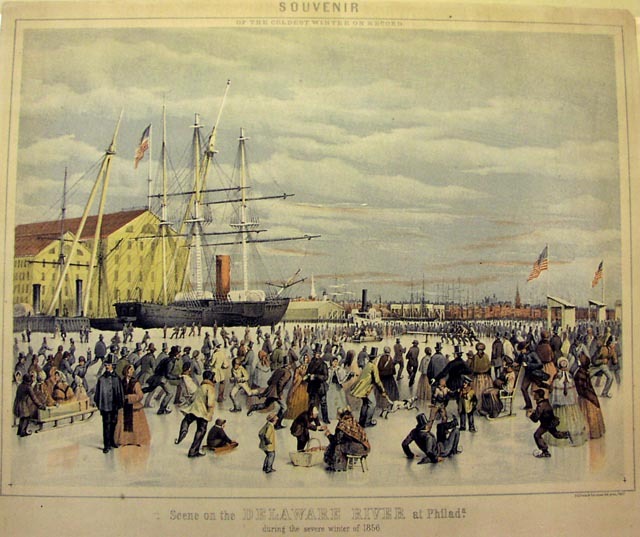 A framed one storied building was put up, well heated, and skates could be hired there. Immediately other ladies tried the sport, and as is always the case, many others followed. One day your grandfather came home full of enthusiasm, and urged me to try to learn. I gave him no encouragement. I was not fond of cold weather or cold pleasures. 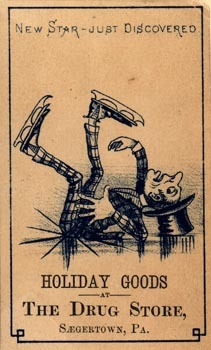 The next morning my boots were missing, and later in the day they were sent home with plates in the heels and a pair of handsome steel skates. A note came with them also, asking me to be ready to go with him to the rink, when he should come home in the afternoon. Of course with such preparations I could not refuse, and my first attempt was made; and as I gained courage and skill my enthusiasm rose in proportion. 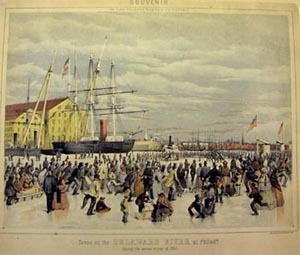 Living the great success of this small skating rink, a Mr. Robert Loury, a year later, opened another, and a much larger one, on the meadows on the west bank of the Schuylkill below Gray's Ferry Bridge, which were flooded in winter to obtain ice. The southern part of the meadows, belonged to Mr. A M. Eastwick, and the skating ground received the name of Eastwick Park. Extensive buildings were put up with platforms running the entire length, from which the ice could be reached at any point. 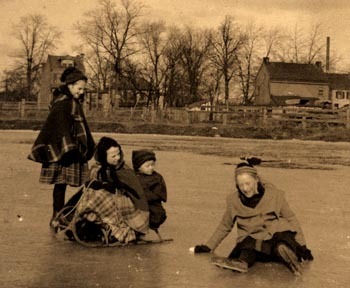 There were skate rooms, where skates could be hired by the hour, or repaired if broken; large rooms, well heated with huge stoves, for resting or warming oneself, a good restaurant and a fine band of music in the afternoon, and also in the evening when it was moon-light. Eastwick Park at once became the fashion, and old and young betook themselves thither every day when the weather was suitable to enjoy the delightful, exhilarating, and healthful exercise. Snow was no barrier for an army of men cleaned it off as fast as it fell, and when the ice became rough, it was shaven smooth with a machine for the purpose." Philadelphia Skating Park, South 2nd and Mifflin St. Max Rosenthal, artist. 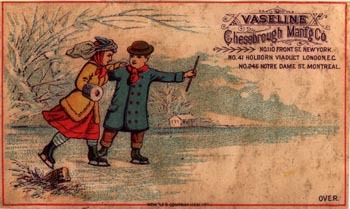 Chromolithograph [Philadelphia: ca. 1870s] Click on Image for larger view. "I must confess that every winter while Eastwick Park survived, much of my time was devoted to the pleasures it afforded. The whole family gave themselves to it. As soon a the children came from school and had dined, we set out for the Park, taking the Spruce and Pine Street horse cars, which were usually overcrowded. They were very much addicted to getting off the tracks, especially in snowy weather, and it was not very pleasant - though often occurring - to be told that all must get out to lighten the car till it was again in place. The story of this Park had lately been written by your cousin John F. Lewis in his History of Skating and of the Philadelphia Skating Club, a paper read by him at the Annual meeting of the club in January 1895, and published by order of this club. I was a member of this club, as was your grandfather, and we always wore when skating, a small silver skate on the left breast, the badge of the club. I have preserved a poem, written at the time by an unknown genius, which immortalized the names of many of the prominent skaters, and which may be of interest. 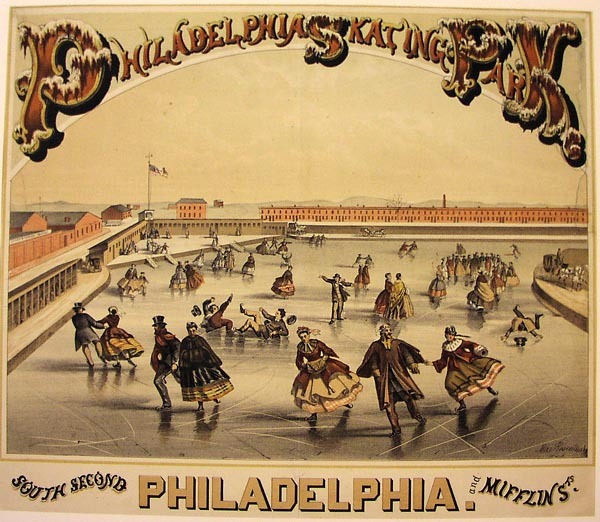 The "Lewis so gay" was your cousin Linda, who was one of the most graceful and skillful skaters in Philadelphia." "I love to recall those pleasant days. How thoroughly I enjoyed the exhilaration of the pure frosty air, the cheery sunshine, and especially the beauty of the winter landscape and the sunsets were so exquisitely lovely as seen from Eastwick Park. On the higher ground beyond the park was a freight station of the Philadelphia Wilmington and Baltimore R. R. and we have often paused in our skating and stood entranced, watching the rings of smoke rising from the locomotives, without the slightest break, high into the air , and tinted with the most exquisite colors from the reflection of the sunset sky." "After three or four years, the ground occupied by the Park was taken for the use of the Railroad Company as a storage yard, and the Skating Park was no more. 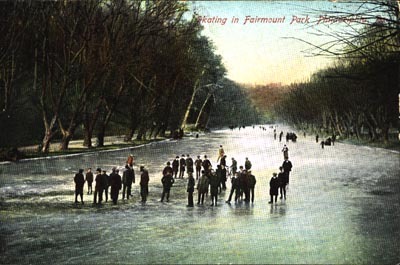 A large Rink was afterwards built at the eastern end of Chestnut Street Bridge, but it never filled the place of Eastwick Park. It was damp and chilly, and it was soon changed into a Rink for roller skating, but that too passed away." -- Anne C. Lewis, 1896. 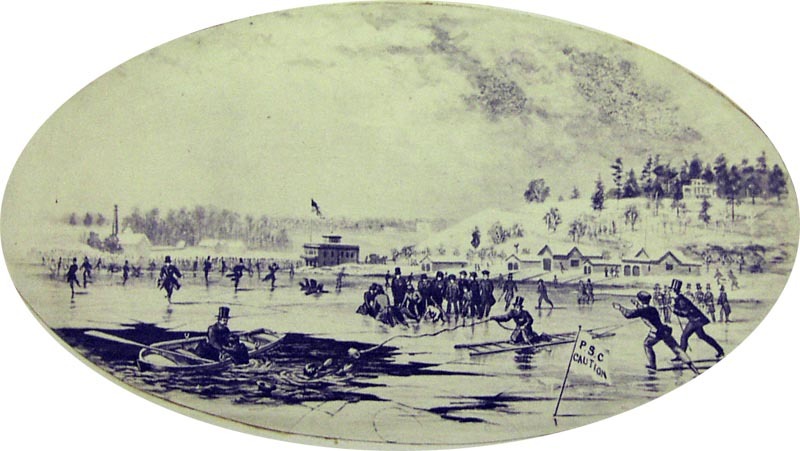 Scene on the Delaware River at Philadelphia during the severe winter of 1856. James Queen, artist. P.S. Duval & Co., lithographers. 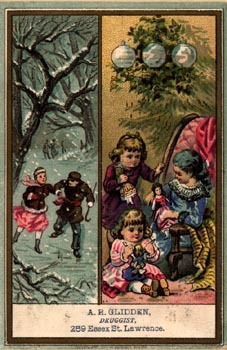 Chromolithograph, ca. 1856. Click on Image for larger view. 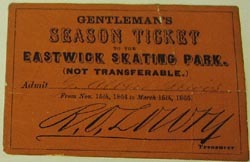 Season Ticket to the Eastwick Skating Rink. From: Anne C. Lewis Scrapbook. Memories of The Homes of Grandma Lewis written for her Grandchildren. Philadelphia: 1896. 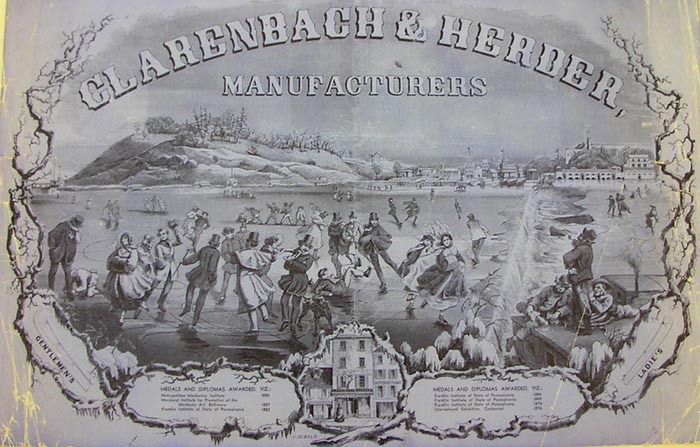 Clarenbach & Herber Manufacturers. [ca. 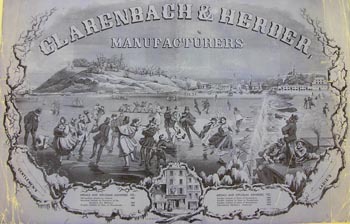 1870s.] Click on Image for larger view.